It's time that I start a huge project: my best friend Julie's wedding quilt. She and Brian are getting married in October (and I'm a bridesmaid, sooo excited!) and I told them that, if they wished, I would love to make them a quilt for their bed as their gift. In the interest of making something that fits their home, I asked if they could plan it out with me. We decided one side is going to be black and white (and cream) herringbones with dashes of royal blue (for Brian). Each of these strips are 2.5 inches wide x 22" long, and this thing is going to be between queen and king size... so you can imagine how long they actually are! The picture doesn't do it justice - there are about 40 strips sewn to each panel so far. Some of the fabrics are special: the third from the right ("Script in Noir" from Minimalista by Art Gallery) is doctor-like writing (Julie is a nurse), the circular one ("French Big Dot in Black" by Suzuko Koseki) has French words all over it (Julie loves Paris), and she loves Sudoku, too (far left). 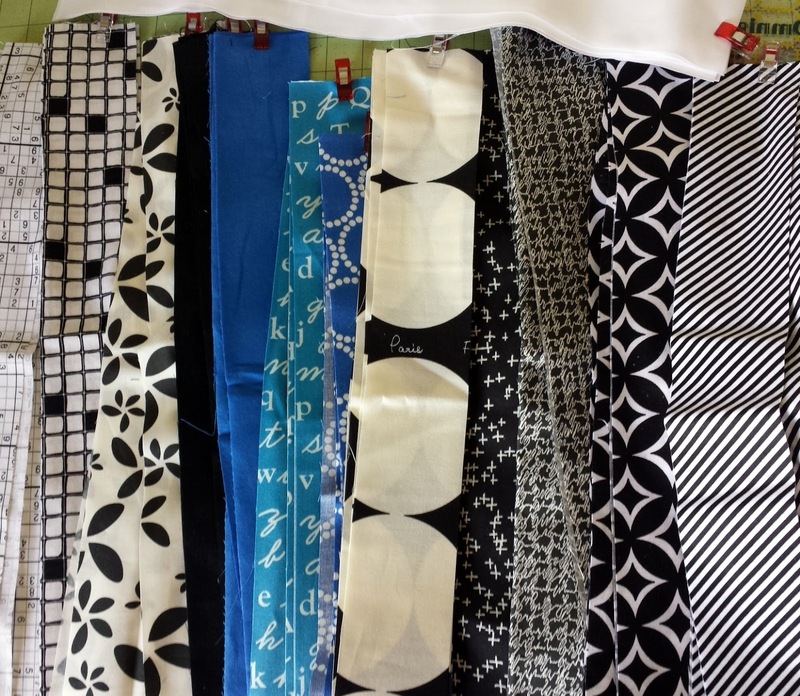 I bought all three of those fabrics, plus more, from the lovely Becca of Sew Me a Song, my sponsor! She always has what I'm looking for when it comes to unique prints. The other side will be a fall theme, covered in red, orange, and yellow squares with notes from their wedding guests. I'll also add in some Modern Maple blocks. I can't wait to put the whole thing together and make an heirloom for their new family! 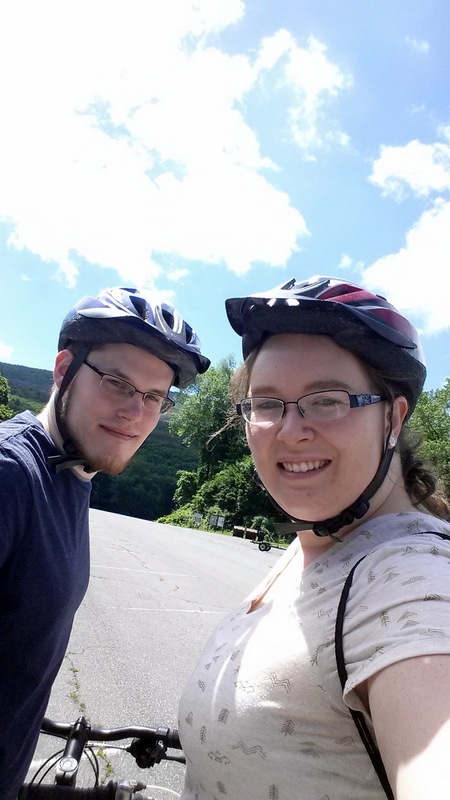 Meanwhile, we took advantage today of the momentarily beautiful weather and drove up to Delaware Water Gap, PA for some biking. We had a blast. If you've never been to the Poconos, it's absolutely a place you must visit. I'm always astounded by the beauty. We saw a couple of small waterfalls and a frog! The trip ended with lots of mud everywhere but it was worth it! :) Hopefully we'll be able to invest in our own bikes soon. Hope you are sewing this week, too! Very pretty herringbone. I haven't done a quilt as you go. 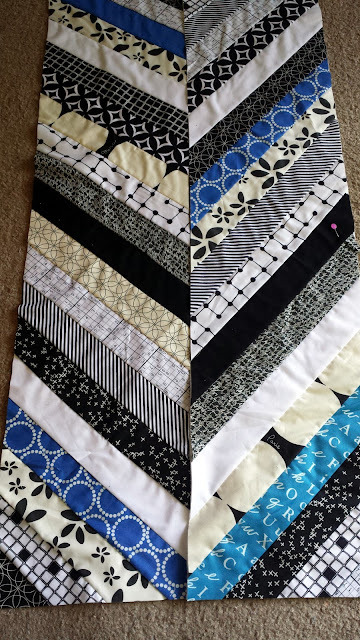 How will you do the seams when you join the sections together so it isn't so bulky? Are you trimming the batting away so you won't be sewing it in the seam? I'm sure they will love the quilt. I love the colour palette you're working here - and such a nice bonus that you're able to work in fabrics that are personalized to your friends! I like the idea of the quilt being reversible and that the opposite side will be so vastly different from the front. Giving someone a custom, two sided quilt is so awesome and generous! I think it's great you included them in designing it, I'm sure they'll appreciate it even more! Looks like such a nice day for a bike ride. What a fabulous gift idea! I love the fact that each side will be so different yet so special. Great job!